Over the years, the recent wars in the Balkans have been all but forgotten. Still, positions remain as polarised as ever, with leftist apologists accusing the West of having demonised the now defunct Serb President Slobodan Milošević to serve its own aims and others bemoaning the fact that Serb atrocities have gone unpunished and were all but rewarded in the Dayton Peace Agreement. Some time ago, Karadžić was caught hiding in plain sight, while now his erstwhile buddy General Ratko Mladić has also been captured. It seems that Serb authorities eventually decided that more cordial relations with the EU are better than hiding a man, demonised by most yet also loved by many if not all Serbs as a hero who served the fatherland. Were the wars in former Socialist Federal Republic of Yugoslavia the result of Serb aggression cunningly exploited by Slobodan Milošević or was it really a case of age-old ethnic and religious hatreds and rivalries resurfacing after the death of Tito??? John Pilger offers this piece of insight: “Yugoslavia was a uniquely independent and multi-ethnic, if imperfect, federation that stood as a political and economic bridge in the Cold War. This was not acceptable to the expanding European Community, especially newly united Germany, which had begun a drive east to dominate its “natural market” in the Yugoslav provinces of Croatia and Slovenia. By the time the Europeans met at Maastricht in 1991, a secret deal had been struck; Germany recognised Croatia, and Yugoslavia was doomed. In Washington, the US ensured that the struggling Yugoslav economy was denied World Bank loans and the defunct Nato was reinvented as an enforcer”. A newly recognised independent Croatia was a danger to Serbia, the once-dominant part of the Yugoslav federation, which duly reacted in force. Prior to the Croatian move, Slovenia had already declared independence after having had to fight some minor battles (“Ten-Day War”). But the conflict between Croatia and Serbia was to lead to more unrest and effectively spelled the end of Bosnia as a multi-ethnic nation where “ethnically Muslim” inhabitants formed a slight majority. In a Yugoslav context, the term Muslim denoted an ethnic identity similar to the nouns Slovene, Croat, Serb, or Macedonian. The requisite Wikipedia entry tells us that ‘the Croatian War of Independence, began when Serbs in Croatia who were opposed to Croatian independence announced their secession from Croatia. Fighting in this region had actually begun weeks prior to the Ten-Day War in Slovenia. The move was triggered by a provision in the new Croatian Constitution that replaced the explicit reference to Serbs in Croatia as a “constituent nation” with a generic reference to all other nations, and was interpreted by Serbs as being reclassified as a “national minority”. The Yugoslav People’s Army (JNA) was ideologically unitarian, though at this stage predominantly staffed by Serbs in its officer corps, thus it also opposed Croatian independence, siding with the Croatian Serb rebels. Since the JNA had disarmed the Territorial Units of the two northernmost republics, the fledgling Croatian state had to form its military from scratch . . . and was further hindered by an arms embargo imposed by the U.N. on the whole of Yugoslavia. The Croatian Serb rebels were unaffected by said embargo as they had the support of and access to supplies of the JNA. The border regions faced direct attacks from forces within Serbia and Montenegro, and saw the shelling of UNESCO world heritage site Dubrovnik, where the international press was criticised for focusing on the city’s architectural heritage, instead of reporting the destruction of Vukovar, a pivotal battle involving many civilian deaths’. And then, in ‘March 1991, the Karađorđevo agreement took place between Franjo Tuđman and Slobodan Milošević. The two presidents tried to reach an agreement on the disintegration process of Yugoslavia, but their main concern was Bosnia, or more precisely its partition’. But rather than just another agreement between enemies, Milošević actively provoked the Serbs living in Bosnia by means of his henchman Arkan. The political scientist John Mueller expressed this fact most eloquently: “the violent conflicts in Croatia and Bosnia . . . were spawned not so much by the convulsive surging of ancient hatreds or by frenzies whipped up by demagogic politicians and the media as by the ministrations of small – sometimes very small – bands of opportunistic marauders recruited by political leaders and operating under their general guidance”. In case of the violence in Bosnia, Milošević recruited Željko Ražnatović, better known by his nom-de-guerre Arkan, to frighten Serbs living in Bosnia by means of staging raids supposedly carried out by Jihad-minded Muslims . . . Arkan’s Tigers, “recently empowered and unpoliced thugs”, effectively turned the (ethnically) Muslim Bosnians into a Jihadist phalanx bent on “ethnically cleansing” their homeland. Bosnia’s population at the time consisted of 45% (“ethnic”) Muslims, 33% (Orthodox) Serbs and 18% (Catholic) Croats. This crazy idea that Bosnia was a place of Islamic radicalism in the heart of Yugoslavia also took root further afield as well. 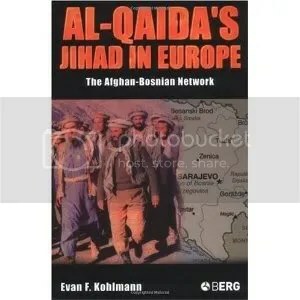 Evan Kohlmann’s 2004 book with the telling title Al-Qaida’s Jihad in Europe: The Afghan-Bosnian Network says it all. The book’s publisher describes this obvious work of fiction in these terms: ‘Terrorism analyst Evan F. Kohlmann unveils a new angle to the deadly international terrorist organization and reveals the root of its terror lies in the Bosnian War. He includes recently declassified American and European intelligence reports, secret Al-Qaida records and internal documents, and interviews with notorious figures such as London-based Bin Laden sympathizer Abu Hamza Al-Masri. This is the first book to uncover the secret history of how Europe was systematically infiltrated by the ranks of the most dangerous terrorist organization on earth, as told by the terrorists themselves and the daring investigators who have tirelessly tracked them over the past decade’. As I pointed out in an earlier entry: ‘Adam Curtis’ documentary The Power of Nightmares (2004) convincingly argues that the U.S. authorities fabricated a terrorist organisation named Al Qaeda based on the testimony of a former associate of Bin Laden, Jamal al-Fadl’. In other words, the fabrication of one “myth” in the U.S. led to the construction of another conspiracy theory which was meant to further solidify the people’s fear of Muslims as people and Islam as a religion. This conspiracy theory was concocted by an ‘American terrorism consultant who has worked for the FBI and other governmental organizations. [Kohlmann] is a contributor to the Counterterrorism Blog, a senior investigator with The Nine Eleven Finding Answers Foundation, and a terrorism analyst for NBC News’, which is an even more disturbing fact. Back to Yugoslavia. In 1999, the BBC reported that ‘[p]aramilitary groups [“recently empowered and unpoliced thugs”] played key roles in the wars in Croatia and Bosnia between 1991-95 and were noted for their ruthlessness and cruelty. On the Serbian side, the two most important paramilitaries were the Tigers, led by Zeljko Raznatovic, generally known by his nom de guerre, Arkan, and Vojislav Seselj’s Chetniks’. And now, Ratko Mladić has finally been apprehended. The BBC described him as follows in 2008: ‘Ratko Mladić was Bosnian Serb leader Radovan Karadzic’s army chief throughout the Bosnian war. 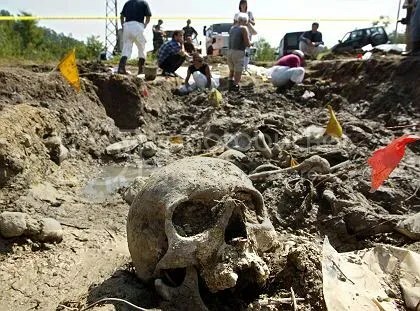 Along with Mr Karadzic, he came to symbolise the Serb campaign of ethnic cleansing of Croats and Muslims and is one of the most wanted suspects from the Bosnia conflict. He has been indicted by the UN war crimes tribunal on charges of genocide and other crimes against humanity – including the massacre of at least 7,500 Muslim men and boys from the town of Srebrenica in 1995. Having lived freely in Belgrade for some time, Mr Mladić disappeared from view when former Yugoslav President Slobodan Milosevic was arrested in 2001. Starting in October 2004, former aides to Mr Mladić began surrendering to the war crimes tribunal, as Belgrade came under intense international pressure to co-operate. They included Radivoje Miletić and Milan Gvero, both accused of involvement in ethnic cleansing. Speculation mounted that Mr Mladic would soon be arrested when Radovan Karadzic was arrested in Belgrade in July 2008’. On Thursday, 26 May 2011, the BBC summarily stated that ‘Gen Mladić, 69, was found in a village in northern Serbia where had been living under an assumed name’. From Belgrade, the BBC’s Mark Lowen writes that it “is hard to overstate the importance of this arrest here in Serbia. Many people feel the destiny of their country was held hostage by Ratko Mladic. Their hopes of joining the EU were ruled out by Brussels while Mladic was at large. I asked President Tadic if it was a coincidence that he was arrested while the EU was considering Serbia’s bid to join the bloc. He said the country had never calculated its search for Mladic – it was always determined to catch him. There is still an ultra-nationalist fringe here who see Mladic as a hero – they say he only ever defended Serb interests. But the new, emerging generation in Serbia seem to be tired of the past and its wars – they want to leave that behind and move forward to the future”. John Pilger, “Don’t Forget Yugoslavia” Information Clearing House (03 February 2009). http://www.islamtimes.org/vdcakynu149no.gt4.html. J. Mueller, “The Banality of ‘Ethnic War’” International Security, 25, 1 (Summer 2000), p. 42. http://instructional1.calstatela.edu/tclim/F06_courses/banality_ethnic_war.pdf. J. Mueller, “The Banality of ‘Ethnic War’”, p. 6. “Killing a Monster: OBL and the War on Terror” A Pseudo-Ottoman Blog (15 May 2011). https://sitanbul.wordpress.com/2011/05/15/killing-a-monster-obl-and-the-war-on-terror/. “Arkan: Feared and ruthless” BBC News (31 March 1999). http://news.bbc.co.uk/2/hi/special_report/1998/kosovo2/308071.stm. “Profile: Ratko Mladic” BBC News (31 July 2008). http://news.bbc.co.uk/2/hi/europe/1423551.stm. “Ratko Mladic arrested: Bosnia war crimes suspect held” BBC News (26 May 2011). http://www.bbc.co.uk/news/world-europe-13561407. Mark Lowen, “Analysis” BBC News (26 May 2011). http://www.bbc.co.uk/news/world-europe-13561407. Why, thank you . . . I will have to read this again to get the details. The main and most important point I take is that it was small paramilitary groups were taking advantage of the situation and that these groups, whatever ethnic identity they claimed, were the perpetrators of the atrocities. Question: Is there a lot of ethnic tension boiling over from that time of violent conflict? What of the future? Also have a look at “The Arrest of Radko Mladic” [https://sitanbul.wordpress.com/2011/05/27/the-arrest-of-radko-mladic/], where the two opposing views on the matter can be seen, respectively in reports by RT and Al Jazeera. As such, I have no clear idea about the nature of the current state of affairs in Bosnia, but judging from my personal experiences in Kosovo, I would say that the seeds sown by Milošević, Arkan, and Mladić as well as their counterparts are still actively promoting distrust and hinder cooperation and co-habitation amongst the different “ethnic” or rather “religious” groups. I’ve got a very close friend who is an ethnic Serb, his parents immigrated here, but he’s been there, and even lived there more than once in the time since then. As unbiased as your Orthodox friend may be, saying that “Kosovo is and was and will always be the heartland of Serbia” is a statement betraying his ideological bias. The Serbs, quarrelsome lot that they are, are probably one of the few, if not the only people who take pride in a military defeat and regard that defeat as the defining moment in their history. I am referring to the Battle of Kosovo Polje (1389) when a Christian coalition was defeated by the Ottoman army under Sultan Murad I. Following the battle, the Sultan was killed by a Serb soldier lying on the ground. With regard to more recent develpments, I would like to refer to something I wrote some years ago somewhere else on the interwebz: “The fact that Mr. Milosevic was a master at manipulation of the media stands at the basis of his success as an “ethnic entrepreneur” (to use Joseph Rothschild’s coinage). The battle at Kosovo Polje served Mr. Milosevic in his attempt to transform himself into the ultimate champion of the Serbian cause, championing the Serbs as eternal victims of unwarranted aggression and oppression. The speech he delivered at Gazimestan on the occasion of the 600th anniversary of King Lazar’s defeat at the hands of the Ottomans (28 June 1989) not only catapulted Milosevic into the limelight of the Serbian media (media controlled by Mr. Milosevic himself incidentally), but also constituted the opening move of his further designs of carving a place for himself in Serbian history. 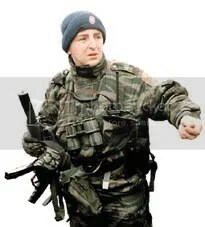 In Gazimestan, Mr. Milosevic said that “[s]ix centuries later, we are in battles again. And facing new ones. They are not armed battles, though such battles should not be excluded yet.” These prophetic sentiments became reality after Croatia’s Franjo Tudjman initiated his bid for Croatian independence and a purely Croatian territory ethnically cleansed of Croatian Serbs. But rather than pursuing Croatia, Mr. Milosevic turned his attention to Bosnia instead (after apparently having reached a tacit agreement with Mr. Tudjman to divide Bosnia between a greater Serbia and a greater Croatia). Arkan and his Tigers started the operation by killing Bosnian Muslims in Zvornik and Bijeljina, with tacit if not active support from Mr. Milosevic in Belgrade. The Bosnian war fought between 1992 and 1995 consists of a veritable catalogue of terror and abuse, terror and abuse perpetrated by Serbia and primarily inflicted upon Bosnian Muslims. Mr. Milosevic’s designs went further than simply killing Bosniaks, he and his henchmen were bent on completely destroying Bosnia’s Islamic heritage (the list of Ottoman buildings destroyed is long and makes for tough reading), inclusive of Sarajevo’s National Library that housed numerous valuable manuscripts as well as archival documentation pertaining to the Ottoman period”.